I’ve travelled to Napa Valley often over the last two decades, and still the list of wineries I have yet to visit, that I want to visit, seems bottomless. Okay well perhaps not bottomless, but there sure are quite a few places I have yet to make it to. Every trip out in addition to recommendations and spots I stumble on I do my best to cross a few off the master list in my mind, of producers I need to visit. One that has been rumbling around in my mind for some time is Smith-Madrone. They’re a Spring Mountain producer that has been around since 1971 While I had tasted their wine a few times over the years my knowledge of Smith-Madrone was largely by reputation. So when I arrived at their property with a couple of friends I was a sponge ready to soak in whatever I could about them. Visiting on Spring Mountain is always particularly exciting to me. It’s off the beaten path and lots of folks don’t make it up there, so it seems a little like a secret wine mission. Once there we were greeted by Stu Smith, half of the Smith brother’s team at the helm of the winery. Stu took us on a tour of their vineyards and taught us a lot about their property as well as things in Napa I wasn’t aware of. One example was the political struggle in the valley faced by mountain vineyards when compared to the folks on the valley floor. It was pretty fascinating to hear especially from a guy like Stu who is incredibly passionate, well spoken and unfiltered in the best way possible. 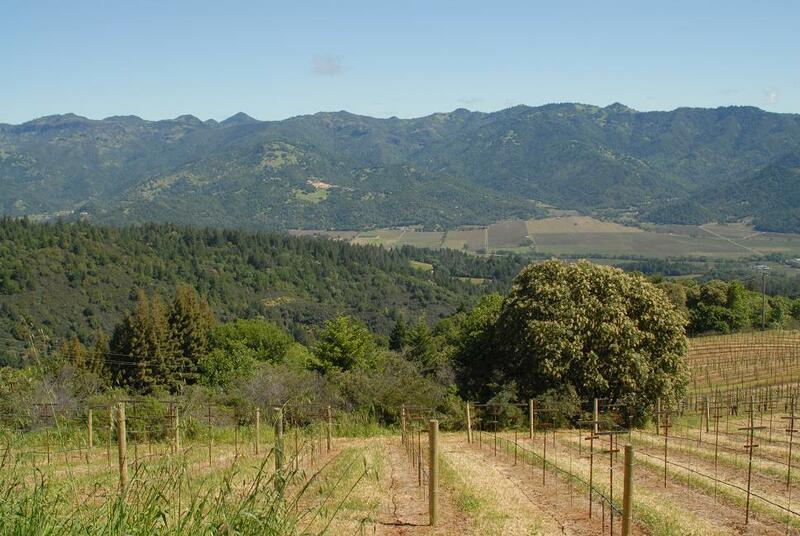 The Smith-Madrone portfolio includes Chardonnay, Riesling and Cabernet Sauvignon. At one time they also made Pinot Noir. Touring their vineyards it was instructive to note the diversity in their topography, spacing, and training. Some of their blocks are being replanted so it was informative to see the plantings that dated back to the early days of the winery versus the current plantings as well as those in between. After a fun, informative and sometimes rollicking ride through the vineyard with Stu as our guide we made our way back to the winery itself. It was at this point that we met his brother Charles. While they both seem pretty involved in every aspect of the operation Charles leans towards the winemaking side and Stu towards the vineyard management side. Tasting through the wines was as much of a revelation as the vineyard tour. Between current vintages, prior vintages and barrel samples we were fortunate enough to taste a few examples of each of their three releases. I didn’t make formal note so I can’t go into great detail about each wine. However as a whole they were impressive. The Chardonnays were really clean and full of fruit. The older of the two (2007 I believe) we tasted from bottle was a bit leaner and had more mineral notes than its younger brother. The Rieslings also featured pure expressions of fruit. There was an impression of sweetness, though they were in fact quite beautifully dry. The Cabernets were simply a knockout. Of the ones we sampled the 2004 was probably my favorite. I have found that when they’re well made, wines that emanate from mountain fruit often show off a pure and intense expression of flavor that is unique. This was the case with the Smith-Madrone Cabernets. They are fruit driven and intense without being fruity and over the top. They are powerful and at the same time elegant and refined. I enjoyed all three varietals quite a bit as they are well made, correct expressions of the grape in question. However the Cabernets for me (at least on the day I tasted them) were just a notch above the Riesling and Chardonnay. Though I’d happily drink any of them. Before the end of our visit we enjoyed a casual picnic lunch overlooking their vineyards at a table right outside their barrel room. The lively banter we all enjoyed about the world of wine in general was a lot of fun. It also gave me a window into Charles and Stu’s thoughts about some wines outside of their own. Most important to me tough was to have their wine alongside some food. As delicious as they were on their own, having them with a picnic lunch enhanced the experience, which is as it should be with wine in my opinion. Much sooner than I wanted to we had to say goodbye to Charles and Stu so we could make it to another appointment on time. While this was my first visit to Smith-Madrone, it certainly won’t be my last. Their open and gregarious nature, desire to share their vineyards and wines are refreshing and reason enough to visit. Of course the wines themselves makes a pretty strong argument as well. When you mix well made wine, with lovely people you have a sure fire winner in my book. Smith-Madrone is a winery I wish I’d visited sooner and one that it’s well worth your time to make an appointment to visit. When your trip to wine country is over it’s sure to be one of the spots you spend a lot of time talking about.